Had a visit with the dietitian today. According to the scale there I’m seven (count them seven) pounds heavier than I was last week at the regular doctors office. I know I shouldn’t let it get to me, but it’s so nice to have a number. A nice round number allows me to put it in perspective. To say, I lost “X” pounds rather than to say, well, I’m fitting in my clothes better and my legs aren’t as swollen. I guess I just expected more. I’ve been working hard and I’m just not seeing the results I had hoped for. I won’t lie to you… it’s incredibly frustrating. You start feeling like Sisyphus, endlessly rolling that stone uphill. This is where it is so easy to get discouraged. I’ve been sidetracked by this before. You start second guessing what you’re doing. You even start questioning WHY you’re doing it, if you’re not going to lose weight anyway. You wonder what the point of all the sweat and pain is. Did I want to cry when I read the scale? Yes… did I get pissy? Oh, yeah… Then I remembered what several of you told me. 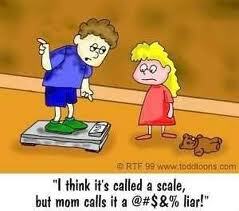 It’s not just about the scale. I have to take heart in the fact I’m wearing a shirt I haven’t worn in awhile, or that two of my favorite polos that I haven’t worn in over a year are just about there (they fit, but are a little short to cover the Buddha). I can take heart in that I’ve pretty much revamped my entire diet and am eating mostly healthy food. I can see that my blood sugar is falling into place nicely an I should have no problem getting my <8 on my next A1C test. This isn’t just a battle of the bulge for me. This is a war, where the stakes are my life. I win, I can live like a normal person. If I lose, I’m well and truly frakked. So, the hell with the scale. I hate the things anyway. Yes, focus on the positives. You’ve made great progress and you should be proud. Let that fuel you and don’t let some probable dysfunction in the scales get you down. It is frustrating and crappy to not get that number as a reinforcement. I’m so glad you are remembering the other positive effects because that’s the true measure, as you said! You’ll get them next week!